Spring is here, and I thought I might look into a short series of articles on how to do practical things. With the world of politics and the economy being so uncertain, a bit of down to earth stuff you can do at home is nice tackle. Some of these will be aimed at bridging the gap between the wonderful world of prepping in North America and how to use them or do them over here in Ireland or the UK. So today with start with Basic Bread Making, which is easier with a machine if you have never done it before, but it is good to learn the old fashioned way as well. This was first used as a Kitchen Post at the UK site World of Survivalists http://www.worldofsurvivalists.com/content.php A wonderful site for folks on both sides of the water, but really useful if you live over here. Hi, today I thought I would see if I could get more postings here and add another recipe. This one is more of a set of directions and I owe a lot of thanks to the various people and books in my life who helped me figure them out. My directions are based partly on having a bread baker, but you don't need one and you won't have one in a long-term situation. Oh, you might be able to rig up a solar or car battery to do this, if your major food preparer has physical issues, but otherwise kneading bread is really pretty easy. There are now lots of You Tube videos that can take the place in old books where they say "to learn to knead bread invite over a friend who already knows" Watch them now and don't wait, here is a good basic one to start with. Don't let the eight to ten minutes scare you, once you learn to knead some breads will come together in much less, you will learn to "feel" the difference, just takes practice. For now, I suggest to all my friends they get a bread baker to get started. The more so if they are busy mothers of small children or single guys with no back up in the kitchen. I don't care for how bread baked in them taste, so I use mine as a kneading machine (I have a bad shoulder) and then bake in a regular oven. But you can (and I do sometimes) bake in the machine and you will still get much cheaper, better tasting and better for you than the store bought stuff. Flour, the following Master Recipe is designed for white BREAD flour but you can use up to 1/2 Whole Wheat, Oats or Rye before you need to change much. After that, the liquids become different, again you can find lots of great recipes on the web for the heavier flours. This is just a system to get you started. I've also used American measurements, since that is what I am used to. Most UK bread bakers come with a 1 cup measuring cup (or they used to) if not either use a measurement translator or buy a set of US measuring stuff. A huge amount of good recipes for food storage are from North America, so it may be worth a few pounds to do this and have a set of everything. I try to have both US and Metric stuff around, but the weight thing is what confusing when using bread bakers. First: read the directions on your bread baker and see if it is a liquid first or flour first. Put the stuff in the order they suggest. If doing this without a bread baker, you need to take your yeast and put it in a small bowl of WARM but NOT HOT water with a tsp or so of sugar and honey. Wait for it to bubble, about five minutes, in the UK or Ireland you will also need to do this with regular yeast as only "Fast-Acting" Yeast works well directly in the bread baker. If using something with some solids in it like mashed potatoes or yogurt as part of the liquid, mix it with the water or milk in the measuring cup. Sometimes you will need to add a bit more water, I suggest not doing this the first time you make bread but wait until you've a couple of loaves under your belt. Eggs are about 1/4 cup of liquid each, but you can test this by just mixing them with your flour or milk until it all reaches two cups. Put your ingredients in order your bread baker suggests. If doing this by hand, add all liquids to the yeast in a large bowl and then the flour gradually. When it gets too thick to stir, begin to knead in the flour by had (see You Tube). If you put oil or butter on your hands it is less messy. Use the dough cycle on your machine, when it is done, take out dough and form into loaves. If you don't have loaf pans, just use a couple of pizza trays, cookie sheets or even heavy foil to make round or long shaped loaves. Cook for about 35 to 45 minutes depending on size of loaf. or about 25 minutes for rolls. For really hard breads add a pan of water onto the bottom shelf of a pre-heated hot oven. For a really soft crust rub bread all over with butter when done. To test for done, hit the bottom of the loaf, it should have a hollow sound. You'll learn to "get it" over time. If bread is very under done by accident, put it back in the oven on a cookie sheet and or use it for toast. For bread you need for sandwiches, try to resist the urge to cut it hot and start eating it, hot bread is one of the most wonderful things in the world but it will squish down and make poor loaves if cut hot. Make a pan of rolls and a loaf of bread instead. Eat the rolls hot. 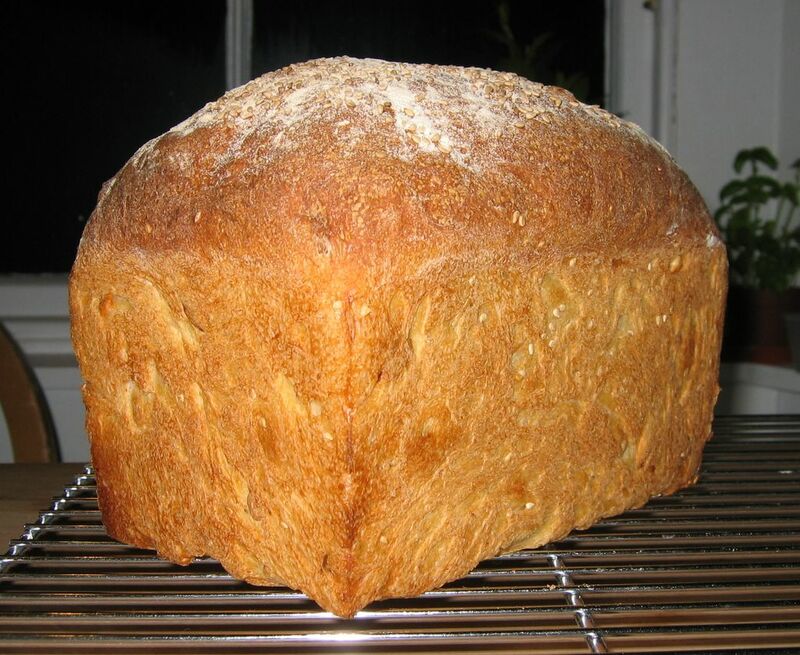 UK Flour: Many folks have trouble using bread bakers because so many of the recipes are from North America where the Default flour is "Strong" enough to bake yeast bread. UK and Irish "Plain" flour is not, it is designed for softer soda breads and cakes. It will just spin around in your bread maker and make a mess. You can make a very soft yeast bread or rolls by hand with it, but it will not work in the machines. Look for BREAD flour or STRONG flour in the UK and Ireland. Many these days will say "good for bread bakers" but you can't count on that. happy bread baking and please post pictures of our results!